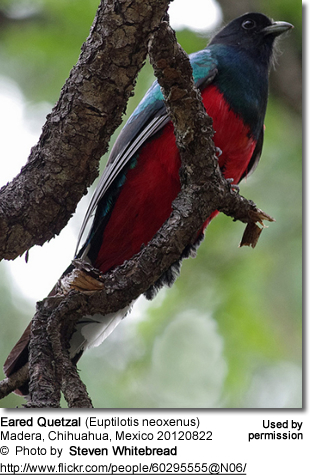 The Eared Quetzals (Euptilotis neoxenus) - also known as Eared Trogons - are rather striking birds that are mostly found in Mexico, except for some rare records from southwestern United States. Eared Quetzals are native to western Mexico - where they inhabit the Sierra Madre Occidental mountain range and the adjacent Pacific slope. They typically remain at elevations ranging from 6,000 to 10,200 feet (~ 1,800 - 3,100 meters). In Mexico, they occur in the Sierra Madre Occidental region from northeastern Sonora and northwestern Chihuahua in northwestern Mexico south to Sinaloa, Durango, Nayarit, Zacatecas and Jalisco, with their southernmost limit being the western parts of Michoacán in southwestern Mexico. In the United States, they have been recorded to in southeasternmost parts of Arizona and southwestern New Mexico in the Madrean Sky Islands regions; specifically in the area of South Fork Cave Creek in the Chiricahua Mountains and the Madera Canyon in the Santa Rita Mountains. Within their range, these birds are resident (non-migratory). 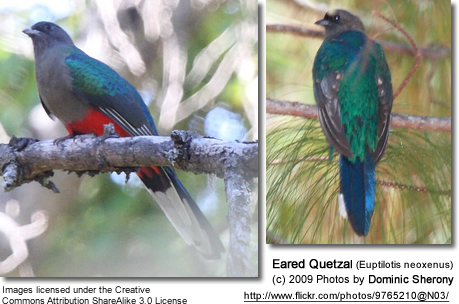 Eared Quetzals are monogamous and when breeding are only seen alone or in pairs. Non-breeding birds may form flocks. They inhabit pine-oak, oak-conifer and pine-evergreen forests, often along streams and near sheer rocky cliffs. 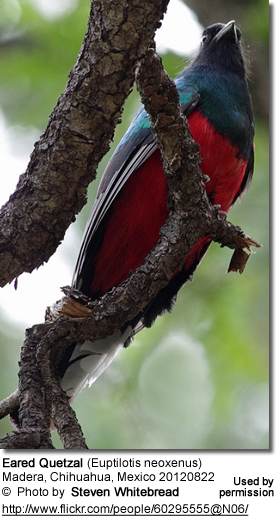 The male has a blackish head; glossy green chest, crown, wings and chest; and bright red abdomen and undertail coverts. The tail is blueish-green above and black below with broad white spots. The duller female can be identified by her grey head, chest and upper abdomen. The red markings on her lower abdomen are less extensive. Immature birds look like females, except for a paler grey plumage and more extensive black on their undertail feathers. Pluck fruit and prey from foliage while hovering momentarily. The breeding season stretches from March to October (with most nesting occurring between June and August). Males perform elaborate flight displays that involve flying above the canopy and then ascending while singing loudly. Nests are typically placed in unlined, shallow cavities of large pine, fir, maple or aspen trees, about 16 - 30 feet (5 - 9 meters) above the ground. They typically take over old woodpecker holes and may use their bills to customize or expand the walls and / or entrance opening to suit their needs. Nests may be reused during several seasons. A clutch consists of 2 to 4 light blue to greenish-blue eggs - the incubation lasts about 22 days to hatching. Both parents share the incubation, and feed and protect the young. Its distinctive vocalizations are far carrying, and are often the first indication of this bird's presence. Described as low-intensity squeals rising in pitch, a loud squeal ending with a sharp "chuck."